The Assembly voted to pass Assembly Bill 373 (AB 373), a bill to reform the state civil service, on Tuesday. The floor debate lasted several hours. Rep. Jim Steineke (R-Kaukauna), the main author and sponsor of the bill, started and ended debate. Minority Caucus Chair Rep. Andy Jorgensen (D-Milton) followed up with a prediction that turned out to be true.
.@RepJorgensen saying after the bills GOP has passed this week, "it's like you're on drugs of some sort"
Debate in the WI Assembly over the civil service bill has elevated to a moderate level of tension. Rep. Gary Hebl (D-Sun Prairie) also invoked the image of La Follette. Rep. Dianne Hasselbein (D-Middleton) questioned Governor Walkers’ motive and involvement.
.@RepHesselbein says #CivilServiceReform bill will create fear in the workplace, "the nasty face of divide and conquer"
Private employment is generally at-will. After the civil service reform bill is passed, state employees still have strong protections. Rep. Daniel Knodl (R-Germantown) discussed the pay raises for strong employees included in the bill, and challenged Assembly Democrats to vote against pay raises for strong workers. Speaker Robin Vos (R-Rochester) struck back at Democrats who said they weren’t involved in the bill’s full process. He questioned why they introduced nine amendments on the floor without letting Republicans consider them beforehand.
.@SpeakerVos says Democrats repeating same talking points "over and over and over and over and over…" etc. That is a direct quote.
.@SpeakerVos says politics didn't drive bill: "All of us ran because we believe in something. I believe in reforming government." 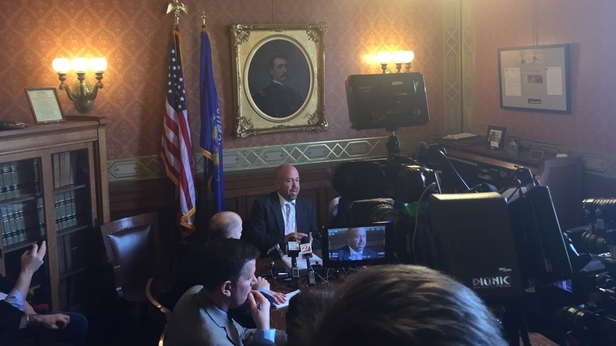 Rep. Mandela Barnes (D-Milwaukee) acknowledged that he liked the ban the box provision in this version of the bill. As the MacIver Institute previously reported, Rep. Steineke’s Assembly version bans the box on thats asks individuals if they have substantially related felony charge. The Senate version of the bill keeps the box, which may lead to issues down the line. Barnes said the provision actually didn’t go far enough, and said it should extend to public and private employees across the state. Throughout the night, legislators clashed on whether or not resumes are an appropriate method of whittling down candidates.
.@RepKessler says resume selection is "absolutely a subjective thing, and the perfect occasion to put your political allies into state jobs"
As part of his closing argument, Rep. Steineke read from Obama administration documents which support the reform of civil service. He argued that if the President supports civil service reform, then it’s not a strictly republican issue or a power grab, as Assembly Democrats alleged throughout the night. In the end, the bill was voted through on a 57-35 vote and will now go to the Senate. Civil service bill passes the Wisconsin Assembly 57-35.